The flag and seal designs were requested by the Quorum Court in 2000 and Mississippi County Quorum Court Resolution No. 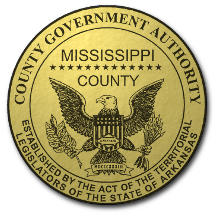 R-99-14 on September 28, 1999 established a special committee to recommend a design for an Official Flag and Official Seal for Mississippi County, Arkansas. County Judge Steve McGuire appointed Nancy Balton, Co-Chairman; Dr. Eldon Fairley, Co-Chairman; Jim Gardner; Mary Bryan Goble; Robert Wiley; Alena Wiley; and Sandra Kennet as members of the Mississippi County Flag and/or Seal Design Committee. The specific purpose of this special committee was the development of a design suitable for use on a flag and/or seal for county business, civic and historical purposes. Design submissions were requested from the public and the Special Committee made their selections from the submitted designs. All submitted designs were forwarded to the Quorum Court Planning and Development Committee with the recommended choices of the Special Committee. The Planning and Development Committee then forwarded their recommendation to the Quorum Court which made the final selection. Mississippi County Quorum Court Resolution No. R-2000-10 approved the seal design submitted by John Allen Nelson and flag design submitted by Shirley M. Richards, Charles Ramey and the Flag Committee as the Official County Seal and Flag of Mississippi County, Arkansas adopted on June 27, 2000. Red, white and blue design on a white background. This related to the colors on the American Flag and the Arkansas Flag. The entire design is contained within two circles. The year date of 1833 represents the year that Mississippi County was formed. The zigzagged blue line on the east border of the County Map represents the Mississippi River for which the county was named. The small outline of the State of Arkansas signifies that we are part of our great State. The red stars identify our two county seats. The cotton boll represents the mighty crop that has brought fame and prosperity to our County. The 5 white stars symbolize those economic and social forces which have contributed to our development and well-being. Beginning with the top-center star and moving clockwise in succession, those forces are represented as follows: agriculture; transportation; industry; hunting, fishing and wildlife; and higher education. All information from the County website: www.mcagov.com/history/county-flag.